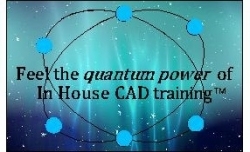 Looking for CAD training in ? We specialise in providing a nationwide in-house CAD training service. * or you can have an Autocad essentials, Intermediate or 3D course which would be run on behalf of an Autocad training centre by an accredited trainer. With an option to gain a CAD skills qualification. Often lower cost than training courses with the added benefit of focused training. No having to wait for course availability. No time wasting early morning commutes to a training centre. In house training can lead to better results. That's because trainees appreciate the individual attention which is not available in the typically larger groups of training courses. People who attend training courses often complain about implementation difficulties when they get back to their office. Often with the responsibility of having to set up templates with company logos & address etc. to suit their printers. We aim to provide better in house CAD training in and you can also avoid the hassle and time waste of a daily rush hour commute to a training course. We provide laptops and CAD software which can be set up in a meeting room along with substantial course companion manuals and laminated quick reference guides for each person attending. You may have an older version of Autocad, or perhaps compatible software. Those are easily catered for with in house training, whereas only the latest software is used on training courses. It's worth bearing in mind that it could be worth training more than one person, just in case that person becomes unavailable for some reason. We can train up to 8 persons with laptops and software provided.